beautyamare: Galaxy Inspired Nail Art! Have you seen Disney's newest animation, Brave? Well if you did, you might have seen the short film "La Luna". It was so cute and adorable especially looking at the Starry Skyline. It was oh so beautiful! If you are curious about it, go to the nearest cinemas and catch Brave! You will love it for sure. Also, you need some catching up to Beyonce's latest performance for “World Humanitarian Day, I Was Here.” Such a strong song and it gives me goose bumps knowing that I am blessed compared to a greater population. Uhhhmmm, before giving in to my emotions, let’s get back to the topic. Ahhahahha the stage was amazing and the background was so inspiring! Have you noticed the galaxy? Full of stars, planets, lights! 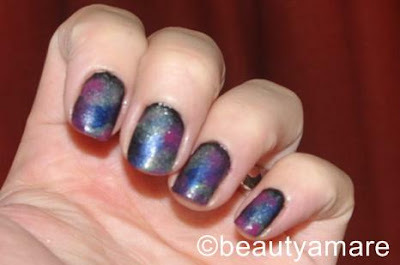 I was so inspired by these two clips that I decided to re-create the galaxy in my nails! Mind you, while I was watching the mid-season finale of Pretty Little Liars, At kept looking at my nails! Ahhahahah it was just sooo amazing that I can get lost just looking at it. Even my husband too can't get his eyes of my nails! STEP 1. Prepare all the necessary lacquers and tools; scissors, tweezers, toothpick, foam and nail polish remover. STEP 2. 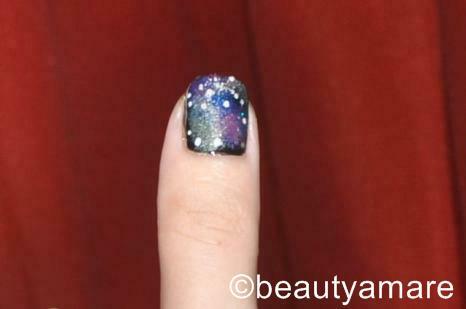 Apply your base coat to protect your natural nails and to provide a smooth canvass for your Galaxy design. Then, apply 2 coats of black lacquer and let it dry. STEP 4. Use your tweezers, or your hands whichever is comfortable for you and get a small amount of the lacquer; slowly dab the foam in your nails and create a design according to your desired look for your galaxy. 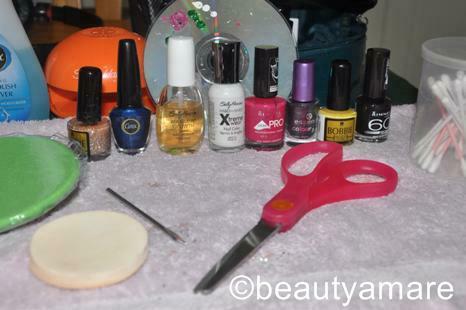 Repeat this process into all your nails and let it dry for a few minutes. Then repeat the process using the yellow and pink lacquers and let it dry. STEP 5. 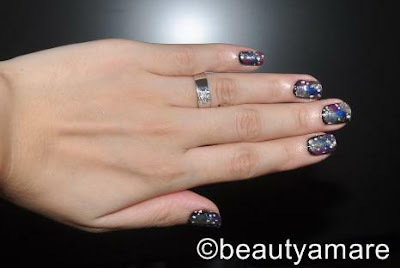 Once your galaxy canvass is dried, get your white lacquer and your toothpick to create small dots. The dots will give you an illusion of planets and stars. 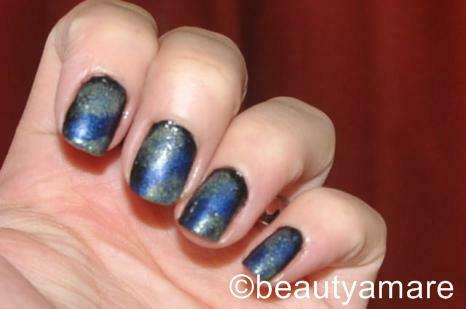 You can skip this step, because giltter polish can give you this illusion as well. STEP 6. Once your canvass is dry, you can now apply yyour top coat it give it more shine and flatten the lacquers to give a 3D illusion. On the side note, kindly visit www.whd-iwashere.org to know more about World Humanitarian Day.